The ADS is a coupled system of a subcritical reactor and an external accelerator. Extra neutrons are generated by a spallation process in the target and the external source neutrons initiate a significant multiplication in the reactor core allowing for an efficient transmutation and incineration potential. 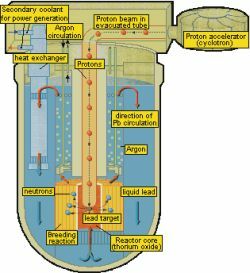 The proton beam enters the center of the reactor core through an evacuated tube and hits the lead target where neutrons are emitted. The pool type reactor is cooled by liquid lead or lead-bismuth. In the design given a bubble lift pump supports natural convection and transports thermal energy to the heat exchangers. Besides transmutation the system additionally serves as a power generator. As for all reactor systems the safety case for the ADS has to be proven. Based on vast experience in fast liquid metal reactors safety analyses for the ADS have been started early and go in parallel to design considerations. The general advantage of the ADS is based on its subcriticality. In the case of a loss of power (station black-out) the accelerator beam providing the external neutron source is shut off automatically and the chain recation in the reactor is stopped. Due to the external source however, a new class of transients / accidents have to be analyzed which are directly linked to the change of this neutron source. In case of a variable source to cope with burnup the source strength could e.g. accidently increase. Other transients may originate on the reactor side. This leads to the analyses of the classical fast reactor transients as loss of flow (ULOF), transient over power (UTOP), loss of heat sink (LOHS) etc.